benefits scientists by providing the opportunity to measure a wide range of biological parameters on both biochemical extracts and on living cells. 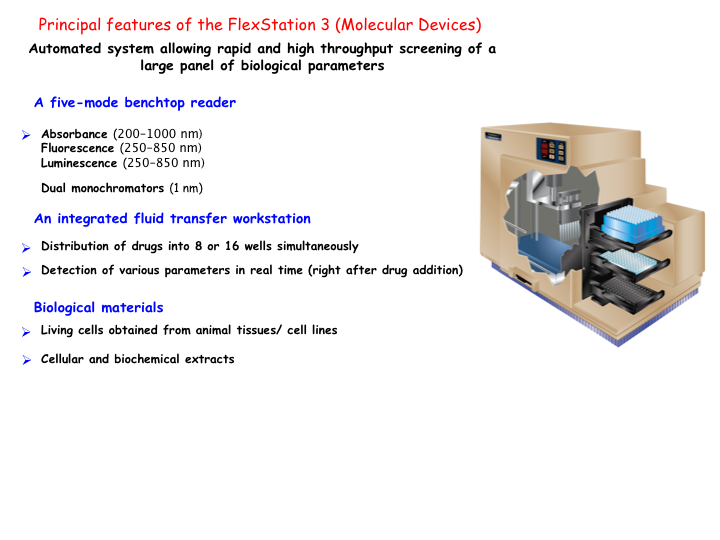 The strength and originality of the FlexStation 3 platform lies in the unique combination of a high-performance multi mode reader with an automated integrated fluid transfer workstation. This allows the user to measure a wide range of biological parameters, to study their kinetics in the range of seconds, and provides a powerful tool for high throughput screening. The FlexStation 3 is a powerful five-mode benchtop reader addressing multiple application technologies including: absorbance, fluorescence intensity, fluorescence polarization, luminescence, and time-resolved fluorescence. Using the dual monochromators, users can target the optimal assay excitation and emission wavelengths by selecting the most appropriate wavelength (200 to 1000 nm) with a 1.0 nm increment. Measurements can be carried out in multi-well plate format (6, 12, 24, 48, 96- and 384-well). The FlexStation 3 uses an integrated fluid transfer workstation allowing automated distribution of reagents or drugs into 96- or 384-well plates. This ensures consistent addition times, minimizes pipetting errors, and provides a powerful tool for high throughput screening. Liquid distribution is operated via an 8- or 16-channel pipettor head allowing the distribution of drugs into 8 or 16 wells simultaneously. Changes in the parameters studied are measured every second immediately after drug addition allowing rapid biological changes to be detected in real time. The microplate reader is thermostated (up to 45°C) and can be set up at a temperature of 37°C so that variations of biological parameters in living cells can be measured. Very few academic structures in France are equipped with the FlexStation 3 platform. Acquisition of this innovative platform by the BFA unit is essential to the development of many research projects.